Dr. Susan Richardson Overstreet is a lifelong resident of Richmond. Following in the foot steps of her father, Dr. Frank Richardson, she attended Randolph Macon College in Ashland and finished with her B.S. degree in Dental Hygiene at VCU in 1987. In 1992 she received her D.D.S degree from VCU, graduating with honors. 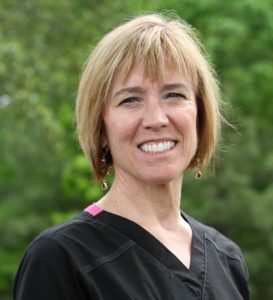 Dr. Richardson Overstreet taught, part time, at the VCU school of Dentistry for five years. Dr. Richardson Overstreet is a member of the Virginia Dental association, the Richmond Dental Society, and the Spear Study Club. Outside of Dentistry, she enjoys her two children, Cameron & Carter, the outdoors, fitness, and anything to do with her Chocolate Lab, Kodi.